Available in Stores Now!! Phil Steele’s 2018 College Football Preview. The 2018 Phil Steele’s College Football Preview is in Stores Now!! I know that most Phil Steele fans are college football junkies and would love my magazine to come out in April or May. First off there are several teams that don’t finalize their spring practices until the first week in May, and this season the NFL Draft is also not until the end of April. I am aware that I lose sales not being among the first on the newsstands, but it is much more important to me to again be the “Most Accurate Preseason Magazine the Last 20 Years!” In May once all the spring camps have ended, I read all the spring notes, make my projected lineup changes. I then talk to as many coaches as I can in the next 3 weeks to make sure I have all the players in the right spots and learn even more about each team. With all the I’s dotted and the T’s crossed, I send it off to the press. This year I was able to talk to over 100 coaches. You may be surprised at how many changes occur with injuries, transfers and unfortunately disciplinary measures. WHEN DOES IT COME OUT? The Magazine it At Stores now!! FIRST – The 2018 Magazine are on newsstands NOW!! About 10 years ago all the college football magazines wanted to be out by July 4th and I will accomplish that. PLEASE NOTE: Many newsstands only take 5 or 10 magazines and sell out the FIRST DAY! We can not make them reorder and with so many different titles to manage, the stores rarely do go thru the extra bother to reorder. The newsstand cost is $13.99, BUT IS THE RISK OF WAITING WORTH IT? This year you will be able to find the magazine at these 7 US retailers. At EVERY Barnes & Noble & Books-A-Million, at 90% of CVS, Publix, Target, Walgreens and Walmart locations nationwide. Also available in Ontario Canada at other independent retailers in the area (limited quantities). However, we do not yet know how many magazines will be ordered by each store or by a particular store location. Having trouble finding the Magazie at a store listed above? If you call with the UPC code of 7 25274 01472 9 (this number never changes from year to year ) before going out to find it at a retailer will save you time as they need to key it into their computer system as soon as it arrives (some input the title in a shorten version, do to ask for it by that it not always effective) and at that point they can tell you, they have it, they have sold out or perhaps in some instances (we know from previous years) they see it in the system and will go to see where it is located (sometimes in their back room and they haven’t even put it out yet, each manager or worker at each location has the responsibility to put it out as soon as it comes in as we pay an additional premium to have this done. SECOND – By ordering through our office at 866-918-7711 or online at the Phil Steele Store. We will start shipping out our orders within 24 hours of your order. The cost is $13.99 for each magazine plus $7.25 USPS Priority Shipping (note: absolutely no handling cost) OR, take advantage of my 2 mag special. 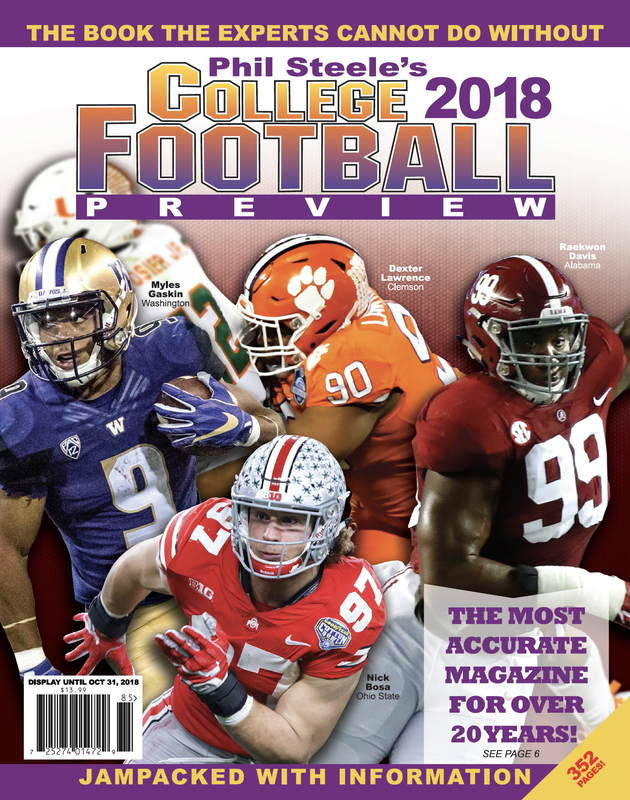 If you call the office or order online a pair of the 2018 Phil Steele’s College Football Previews shipped to the same address at the same time save $11.25 with the 2 magazine special and pay just $31.23. THIRD – To be the earliest to get your hands on the 2018 information. Right now we have the digital browser version of the Magazine available. You can get a copy of the magazine on any phone, tablet or computer browser here. Also you can find the app version on Google Play Store just by searching Phil Steele right now. The Magazine will also be available on Apple App Store and on Amazon Kindle devices as we are still waiting on their approval to be released. Quick Note those of you that have paid for the digital browser version you can use the came login credentials to use with the Google App, Apple App and Amazon Kindle. We will keep you posted right here on PhilSteele.com when the other 2 apps become available. Here is the Phil Steele’s 2018 College Football Preview National Cover. To find out how to get a hold of your own copy check out the blog below. Most of you purchase my College Preview year in and year out. However, as the Magazine’s fan base continues to explode, I get many of the same questions asked multiple times. Let me hopefully answer your questions now, and if I missed one, feel free to ask it on Twitter @PhilSteele042.